Die Axis Webcams bieten Spitzentechnologie auf dem Gebiet von Netzwerk-Kameras. In allen integriert ist ein eigener Webserver sowie eine Ethernet-Netzwerkkarte. Fragen Sie uns nach dem günstigen Tagespreis von nicht aufgeführten Artikeln. Wir bieten das ganze AXIS-Sortiment an. With a built-in Web server, the AXIS 210 connects directly to an IP network, enabling remote monitoring over a local area network or the Internet using a standard Web browser. Backed by the industry’s largest base of application software for video and alarm management, the AXIS 210 is an ideal choice for securing offices, shops and other facilities. 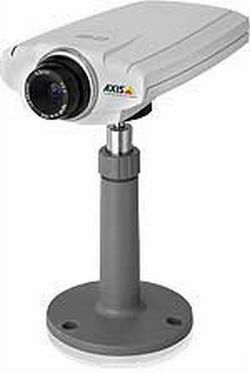 The AXIS 210 transmits superior quality, Motion JPEG-based video at up to 30 frames per second. For applications where available bandwidth is restricted and higher frame rates are required, support for MPEG-4 will be offered as a free downloadable upgrade that will be available in Q3 2004.